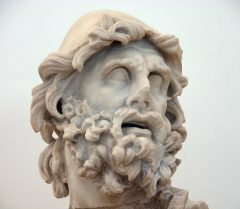 2003: The Odysseus Unbound project begins. 2005: Publication of ‘Odysseus Unbound: The Search for Homer’s Ithaca’ documenting the basis for the theory, identifying candidate locations matching the landscape described in the ‘Odyssey’, and describing the surface geology of the Thinia valley as a candidate for ‘Strabo’s Channel’. 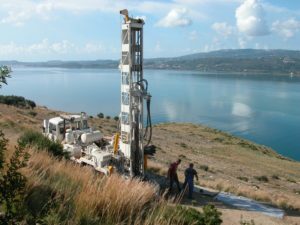 2006: Drilling of a 122 metre (400 foot) test borehole near the diagnosed southern exit of the marine channel and marine surveys of the bays to the north and south of the Thinia valley. Read the detailed results report. 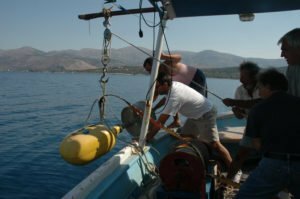 April 2007: Collaboration begins between the Odysseus Unbound team and the geo-technical consultancy company FUGRO. 2007 – 2009: An extensive programme of geological research encompassing further marine seismic surveys, gravity-based measurements of its cross-section, a hydrological pilot survey of the surrounding area via resistivity readings and ground penetrating radar, detailed geological and geomorphological field mapping of the expected course of the channel. 2010 – 2011: Following a helicopter-mounted electromagnetic survey, ground-based resistivity and seismic refraction surveys, gravity surveys, and shallow marine seismic reflection surveys, a programme of land-based shallow (less than 105 metres in depth) drilling and rock coring using a small mobile rig was undertaken in the Thinia Valley and at Atheras Bay. Download the 2011-2014 Geoscience Research Report. 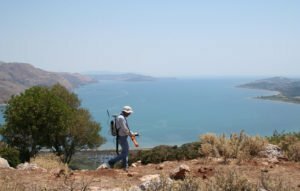 2016: Extensive near-surface geoscience research, in collaboration with the National Technical University of Athens (NTUA), using electromagnetism (EM), ground penetrating radar (GPR) and electronic resistivity testing (ERT), to identify sub-surface features relating to a possible harbour and to possible anthropogenic structures on the Paliki peninsula. 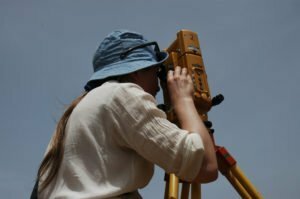 2017: Extensive geological and near-surface geoscience research, in collaboration with NTUA and leading geologists, to uncover the complex geology of the Thinia Valley and to identify sub-surface features relating to possible anthropogenic structures on the Paliki peninsula.